Seeing as I still had a bet with a friend to, at some point in our lives, do a real-life Robot Wars, I figured I’d give it a shot. It just got in a few days ago, so I figured I’d write a quick review. Four DC-motors with gearboxes pre-attached to the bottom plate. 4 tires that nicely fit the motor gearboxes. An Arduino Sensor Shield v4.0 clone. Both acrylic plates appear to be roughly 5mm thick, instead of the stated 3mm and 5mm. The “Holder kit” seems to refer to the 9V block battery holder. the “Steering gear” seems to refer to the pan-tilt holder, which appears to be completely unrelated to steering. There were a lot of bent pins on both the arduino and the sensor shield. They didn’t even fit together without manually bending everything back. The silkscreen on the Arduino is barely readable, much much worse than an earlier Arduino clone I ordered from dx.com. The power jack on the 9V Block battery is so fragile that it falls apart when you try to pull it from the Arduino. The motor gearboxes were horrible without manually oiling it. The only components to actually fit the chassis are the ones already mounted on it (motor-driver and motors), and the pan-tilt thing. There are no holes that match those in the arduino, none that match either of the battery-packs, none that match any of the sensors. The pan-tilt system needs two servos, but the package only contains one. Furthermore, the pan part needs a servo attachment piece that isn’t packaged with the servo. Neither of the battery boxes seem to pack enough power to easily power the motors. The remote features a lot of buttons specific to an audio-player, which doesn’t really fit an RC-car. Apart from that, it’s IR which has horrible range, and requires both the remote and the receiver to be aimed precisely. All in all, the quality is far from perfect. The total comes down to precisely $74.90, whereas the complete package costs $79.60 at the moment of writing. That’s only $4.70 more for the acrylic parts, motors, and wheels, which seems like a fairly good deal. If you know how to use all the parts, and could probably use them in other projects anyway, this might be a pretty good buy. If you’re expecting a complete kit that you can easily put together and then program using the arduino, this will be a complete let-down. However, if you’re creative enough and willing to get your hands dirty, I think there’s loads of potential in this kit for a nice RC-car. Yes, it doesn’t really fit out of the box, but it’s easy enough to drill a few extra holes in the acrylic plates. Buy one of those cheap bluetooth to UART kits, and use an Android (or other bluetooth-capable) phone to control it. Use a single thumbstick or a full blown joystick shield as a remote control instead, possibly paired with the 433 solution. Thanks for the review! I ordered one of these 2 – 3 weeks ago and it still has not shipped. Your review confirmed my fears and I canceled the order. It’s too bad somebody had to be the guinea pig for this kit. 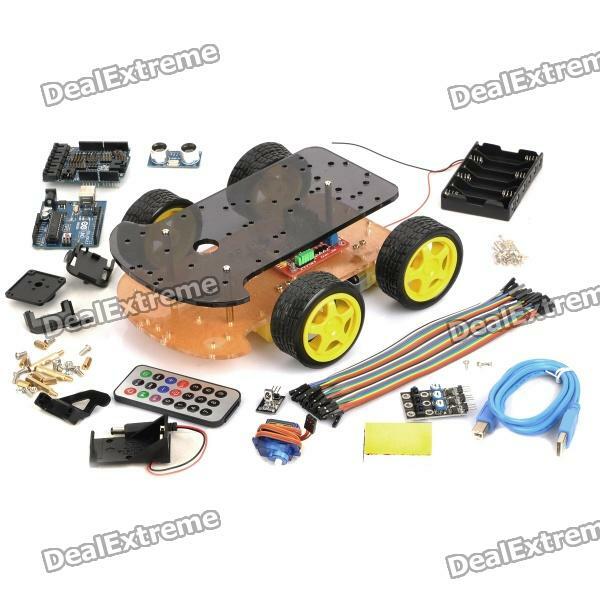 I have bought this robot from DealeXtreme website, but it does not contain any structure manual and arduino codes .